Oh yeah, remember how a chunk of this blog is supposed to be dedicated to food? Yeah, apparently I forgot too. Well, that’s not totally true. I work five evenings/nights a week, and it just so happens that in the last few weeks, my two nights off have meant either going out for dinner or L cooking, and although I like cooking, I’m certainly not complaining about that. Anyway, asparagus are in season, and that is pretty much impossible to resist, so I put my foot down this week and said I was going to cook. 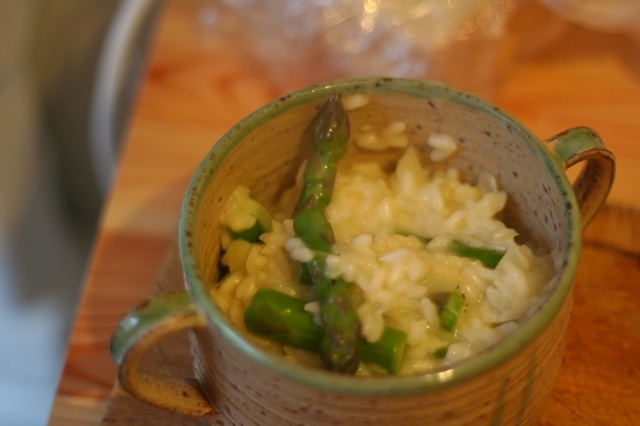 There are lots of delicious ways to eat asparagus, but one of my favourites is risotto. When I was home in the evenings more often, risotto was one of my go-to meals because, once you get comfortable with it, you realize how easy it is. Truly, risotto is not difficult, but it does require a little attention and comfort with free-form cooking. 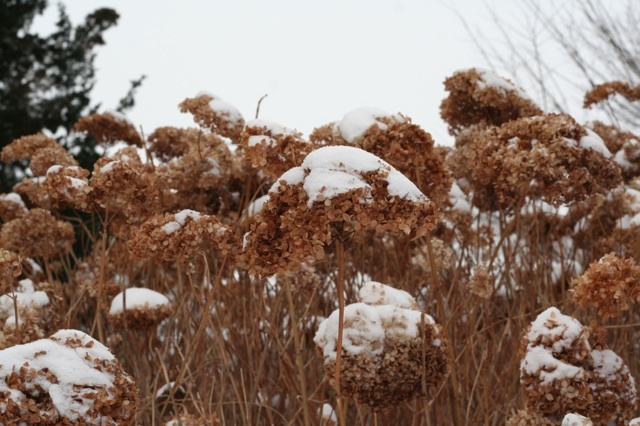 Once you get the basics, though, you can make it with just about anything, which is another plus, since it will carry you through the various local growing seasons without any trouble. Anyway, here’s how I do it – this isn’t a typical recipe because, as I said, it’s kind of free-form, but I have numbered the steps and bolded the ingredients. 1. In a saucepan, heat up some vegetable stock (well, if you eat meat, chicken stock is fine too). I try to keep some homemade stock on hand for this sort of thing, but if you don’t have any, the boxed stock from the grocery store is a good second. If you need to use bouillon cubes, in a pinch, that’s okay; I would use slightly less than recommended, though, because cubes tend to be more salty than other options. You will need slightly more than twice as many cups of stock as you use rice. So, for 1.5 cups of rice, heat up 3-4 cups of stock. 2. In a wok or high-sided frying pan, melt 1-2 tbsp of butter over medium-high heat. Add a little olive oil to keep the butter from burning and add a finely-diced onion. Cook for five minutes or so, until the onion is soft and translucent. Add three or so cloves of garlic, minced. Cook until you can smell the garlic, another two or three minutes. 3. Add 1.5 cups of arborio rice (yes, there are other risotto rices, but they’re generally more expensive and more difficult to find; arborio is fairly ubiquitous now – basmati or other similar rice will not work, so don’t bother). If the pan seems a little dry, add a bit more butter and toss the rice with the onion and garlic until it is well coated. Let it toast for a minute or two. 4. If you have some white wine kicking around, this is a good time to add a half cup. If not, don’t worry. Using a ladle, add enough stock to cover the rice/onion/garlic (about a cup). Let it bubble down to a simmer and give it a good stir. The more you stir, the creamier the risotto, so don’t shirk on the stirring. 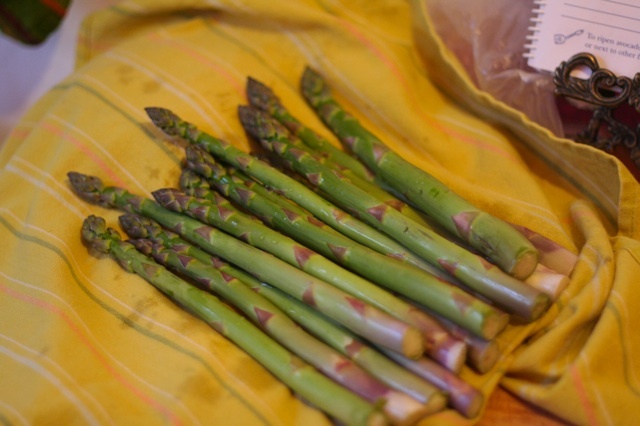 This is a good time to get the asparagus ready (by which I mean, wash it, snap off the ends, chop it into bite-sized pieces, and set aside). 5. When the liquid starts to diminish and the mixture starts to thicken, add more stock, adding it by about a ladleful at a time and remembering to stir. The idea is that by slowly cooking it, the rice will take on the flavours in the stock and release its starch into the liquid, thus creating a yummy, creamy meal. Adding stock by the ladleful allows you to control the amount of liquid in the pan, so you don’t end up with a really liquidy mess at the end. 6. Grate some cheese. With asparagus I like an extra-old white cheddar, but it’s up to you. I usually grate about 1 cup. 8. When the liquid has receded, taste it again. If the rice isn’t soft all the way through, add a little bit more stock; if it is, add the cheese. Turn the heat down a little and stir the cheese through so it melts into everything. If it seems a bit liquidy, let it cook a little longer (but not too long, or the rice will overcook!). Bear in mind that the cheese will solidify a little as it cools on the plate. 9. Season with salt and pepper and serve! This method will work for any risotto. Some veggies you may want to prepare beforehand (like roasting a squash) but by and large, you add them at the same time and pair them with a cheese you like. Are you already a risotto fan? What are you favourite pairings? Remember how I said I was going to start making bread on the regular? Well, so far so good. I would guess that I make about 60% of our bread (this is an average because L eats way more bread than I do and buys bread to keep at the lab; I eat almost entirely homemade bread, unless I’m feeling lazy and then I just go to the bakery), which is not too bad. Mostly I’ve been making the overnight, no-knead French loaf, which is a really easy staple as long as I’m on the ball enough to plan ahead. 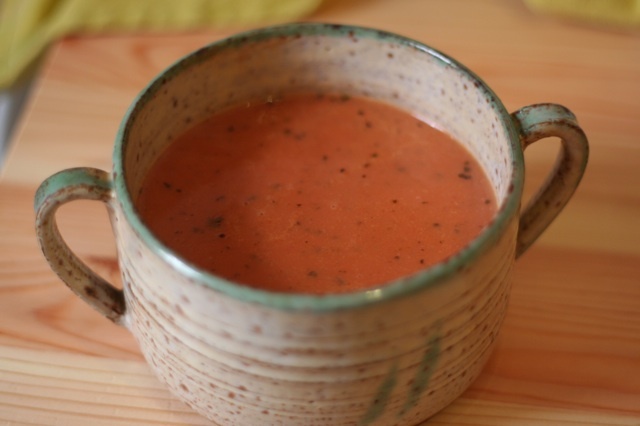 I tried something a little different the last time I made this and substituted a half cup of flour for a half cup of flax meal. It added a really nice nutty sort of flavour and still rose beautifully. But, because there are mornings when I get up to discover all the bread has disappeared overnight (or something), and I need bread for something before tomorrow, I’ve started trying some other recipes (as I said I would). I bought a very nice bread pan (tin? 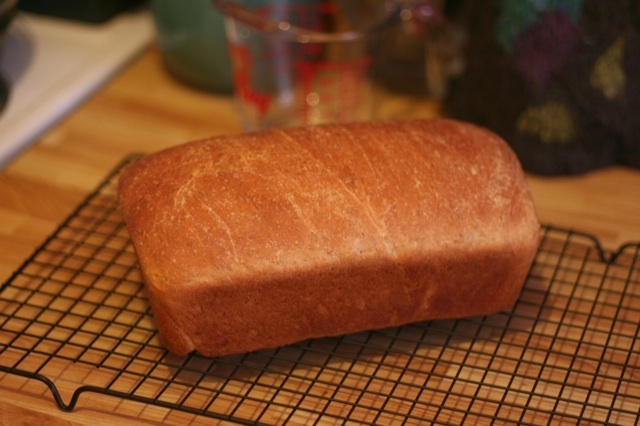 ), and the first right-now loaf I made was Honey Wheat Bread, which is an easy and delicious loaf for sandwiches and whatever else you might use bread for. Not bad for a first attempt, I thought. And not too sweet, either. I followed all the other directions as-written, except, obviously, dividing the dough into two equal portions. The results were awesome, but I will have to work on my rolling technique in the future, as I ended up with a large air pocket just under the upper crust. Otherwise, though, I cannot recommend this recipe highly enough. Next up, I think, will be this Light Wheat Bread, which takes a little longer, so it will have to be made on a day when I’m kicking around the house. After that, I’m not sure. What are your bread standbys? Any chance you have a great raisin bread recipe you wouldn’t mind sharing? That’s what we’ve been having here in the last month or so. It all started because I work afternoons/evenings, and thus I pack a lunch dinner to eat at my desk. Because I’m a little lazy, this means I eat a lot of sandwiches at work. Don’t get me wrong – I love sandwiches. I love sandwiches so much (and especially grilled cheese sandwiches) that my sisters joke that I’m not a vegetarian, I’m a bread-and-cheese-atarian. I take exception to this, because I eat fewer grilled cheeses than people think. Anyway, that’s all an aside. Basically, I eat a sandwich for dinner almost every day and therefore, I like to at least have good ingredients, such as bakery bread, to use. There is only so many times you can use grocery store bread before you start dreading dinner. So, I started buying bread from the bakery around the corner (there are are more bakeries within 30 seconds of us than is healthy). It was delicious bread, so we ate it quickly, so we bought more, so bread expenses went up. For me, this was okay, a sort of business expense, if you will. For L, it was extravagant (he eats dinners at home, after all). Anyway, we talked about it and I offered to start making bread, which would mean I still go nice bread for my sandwiches, but it would be far less expensive. I was raring to go and then L bought two loaves of bread in a row, so it was a bit of a false start. I have not managed to take a picture of a full loaf. They just don't last long enough. Nonetheless, we’re back on track now and I’ve made three loaves of bread this week. One was a housewarming gift for Wendy and her boyfriend (don’t worry, we don’t eat that much bread), but the other two were for us, and both turned out very well. 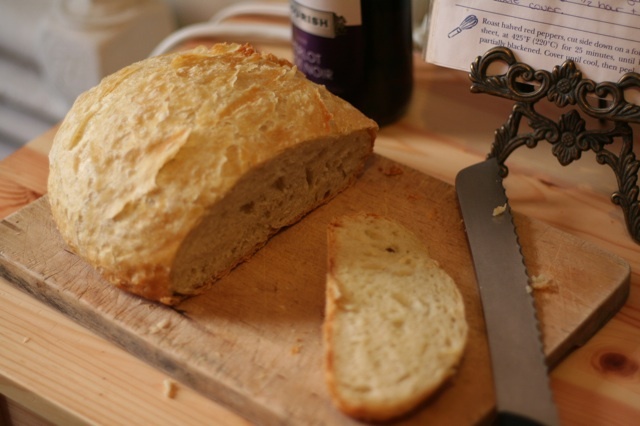 I plan to experiment and try some new recipes, but for now my go-to is a no-knead, night-rising French bread that is too good not to share – I mean, this bread pretty much makes itself, you just have to plan ahead. Mix everything together in a big bowl until it resembles a wet, shaggy, sticky dough (you will know what I mean when you see it). Cover the bowl with plastic wrap and let it rise for 12 or so hours (I make it before bed, but you could just as easily make it before work in the morning). Punch it down, cover it back up, and let it rise for another two hours or so. About a half hour before baking, heat a dutch oven (that is, a solid – NOT glass – dish with a lid) at 425-450F until fully warm (I just leave it in there for a half hour because that’s easier). Turn dough into warm dish (no greasing or flouring necessary) and bake with the lid on for a half hour and then with the lid off for 15 minutes. I am convinced that this recipe cannot be messed up. I’ve let the dough rise for 48 hours; I once had dough that didn’t rise properly (not enough water), so I punch it down and let it rise for another day and it was fine; I’ve baked it at 350 instead of 450 and even though it took a little longer, it was still fine. Seriously. 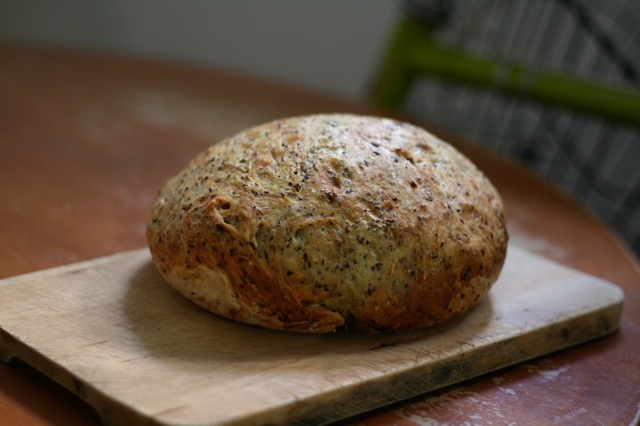 If you have never made bread but are curious about it, this is your gateway bread. The unfortunate quality of this photo is courtesy of my phone. Nonetheless, a daffodil! In full bloom! In March! 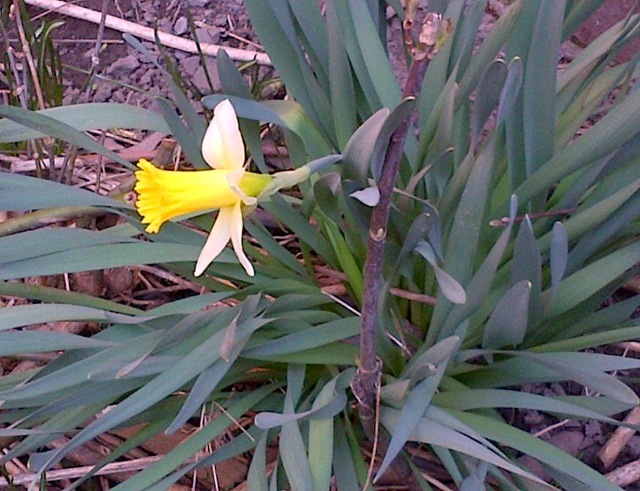 Also, there are daffodils out. In March. What the heck is going on here? I keep trying to not get my hopes up that winter is really and truly over (I’ve been disappointed by March before), but I don’t know. Daffodils. That’s really something. I admit that I had hoped to be posting about finishing my Almondine socks, but I haven’t had as much time to knit this week as I’d hoped and it’s looking like it may take the weekend to get them done. Am I the slowest sock knitter ever? Maybe. But I’ve been distracted, at least partly by the following. 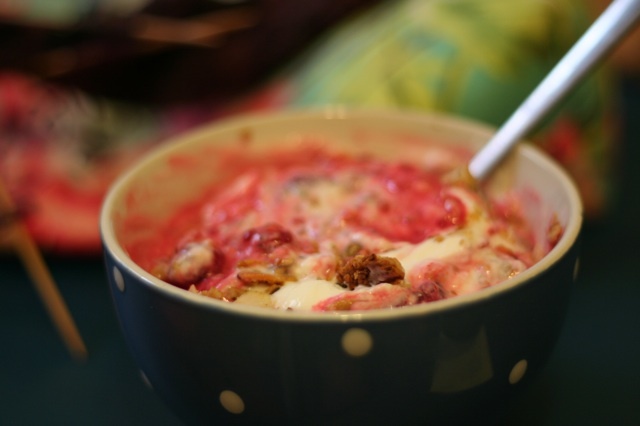 For a while last year I was in the habit of making granola regularly – every two weeks or so – because I loved having it with fruit and yogourt for breakfast. It was quick, healthy, reliable, and, when I could get to Bulk Barn for supplies, quite cheap. This habit ended abruptly in September when L and I moved and our new oven was such a disaster I put off cleaning it for a month. That, combined with no easy access to a bulk foods shop (a new one has since opened downtown) put an end to my granola making. Well, no more! 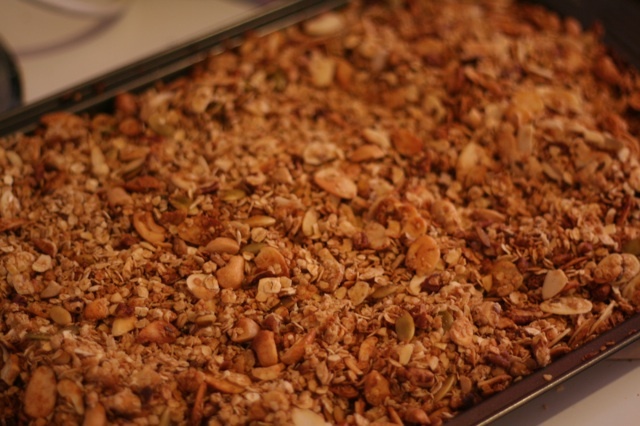 Inspired by L’s recent musings about how it’s been a while since I made granola and the Slate Culture Gabfest (one of my favourite podcasts)’s recent Granola-off – you can listen to all the action here – I decided it was time to revive my granola habit. I am so pleased I did. Our apartment smelled great, breakfast is no longer a sort of sad chore, and it felt a little like getting reacquainted with an previously enjoyable routine. The recipe is below. After it's all mixed up (the pink is from raspberries). 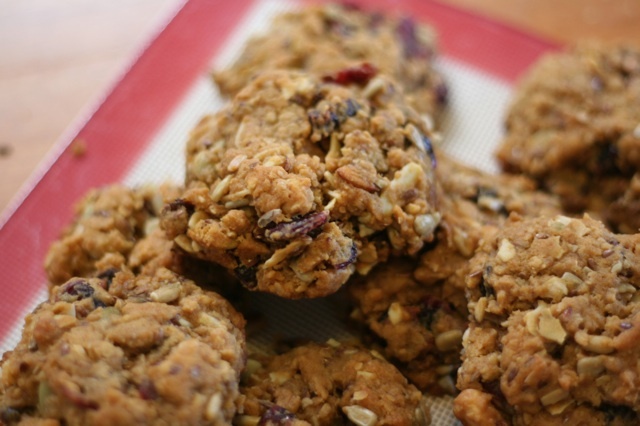 But yes, my post title does say Granola, Two Ways, so here’s the second: cookies. 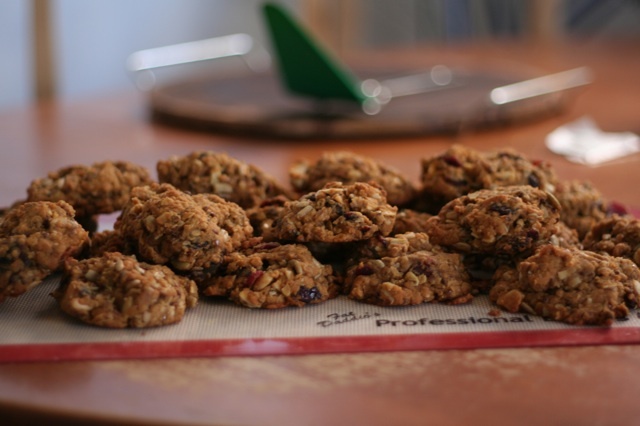 Although I usually call these Trailmix Cookies, they have pretty much all the same ingredients as my granola, with the addition of baking things and dried fruit, and are just as simple. There's a lot in there. 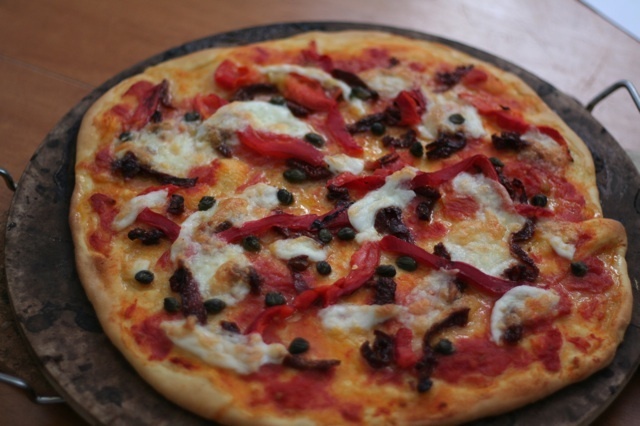 This is the basic recipe I used (from food.com), but I definitely modified it. For example, instead of 1 cup of brown sugar, I use 1/2 cup of molasses and a 1/2 cup of brown sugar, which lets me get away with not using any eggs; I also use shortening over margarine; 2 cups of flour instead of the flour-wheat germ blend; and no chocolate chips. As for nuts, seeds, and dried fruit, I just use whatever I have on hand. The result is a reliably delicious, but not too sweet, cookie chock-full of crunchy, chewy goodness. Seriously, you cannot go wrong (even my sisters, who hate raisins in every form, love these cookies with raisins in them). Preheat oven to 300F and lightly oil a large baking sheet (make sure it has edges). 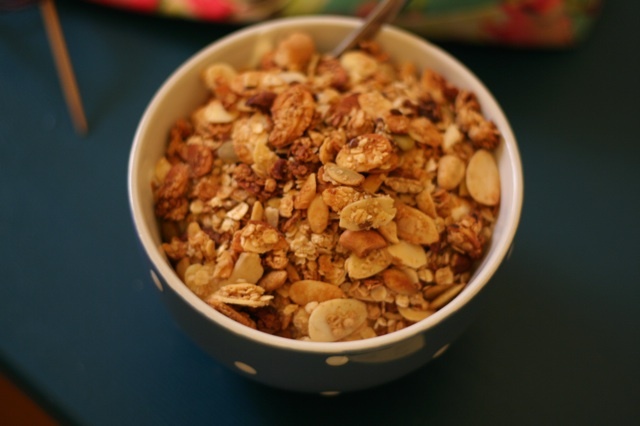 Mix oats, nuts, seeds, and cinnamon in a bowl. In a small saucepan, combine oil, sugar, and honey. Bring to a simmer, remove from heat, and add vanilla. Pour hot liquid over dry ingredients and stir well. Use your hands to toss the mixture until everything is thoroughly covered. Spread on prepared baking sheet and bake for 30 minutes, stirring every 10 or so minutes, until it’s golden brown. I love pancakes. Love them. When I was at home my mum and I made pancakes for breakfast on Sunday (my grandparents were visiting, so we dressed up breakfast a little), but even though I had eaten pancakes recently, when I realized it was Shrove Tuesday yesterday, I knew I would have to whip up some more. 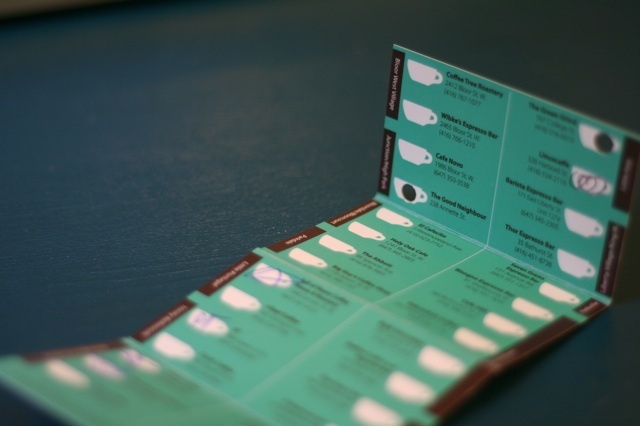 We had spent the rather overcast and rainy day in the Junction (one of our favourite neighbourhoods) making use of our Coffee Passports. 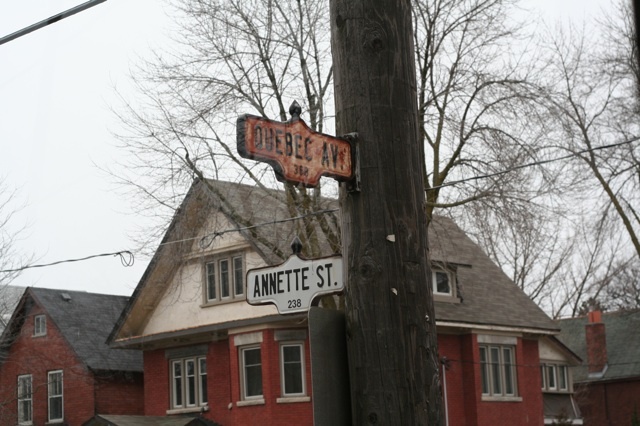 Actually, as an aside, if you happen to live in Toronto, I definitely recommend The Good Neighbour, a café at Annette St. and Quebec Ave. – it had great decor, a delicious selection of drinks and pastries, and was a productive place to get a little work done. Anyway, from there we went to a pub to watch some soccer (I knit, he watched) and then headed home. Long story short: In our ramblings I had only managed to eat a muffin (albeit a delicious muffin) since breakfast, so when I got home around 5 I was starving and immediately set about making myself a grilled cheese. I realized an hour later that it was pancake Tuesday. 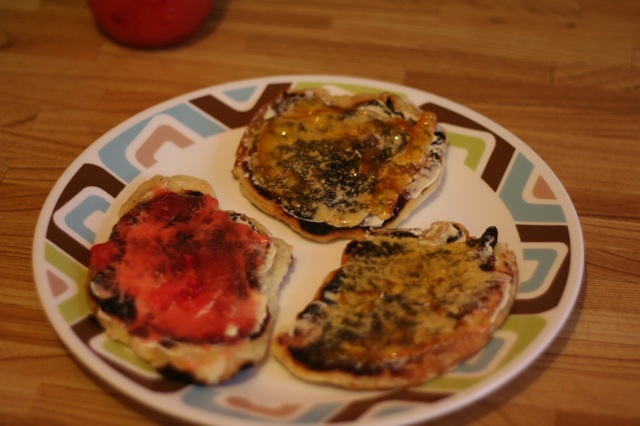 Luckily, L had a late frisbee game, so I had a feeling he’d want a bite to eat when he got home, which meant I could make late-night pancakes without worrying they wouldn’t get eaten. The real bonus, though, was that neither of us were hungry enough to eat more than two each, so we got to have leftover pancakes for breakfast this morning. There’s something about cold pancakes with jam that I just can’t get enough of, so Pancake Tuesday turned out to be a success all around! 1. Mix dry ingredients in a big bowl. 2. In a small bowl, combine wet ingredients and mix well. 3. Add liquid to dry and beat until smooth (if you let it sit, you will probably need some more milk to thin it out – the baking powder makes for fluffy pancakes, but it starts working quickly). 4. 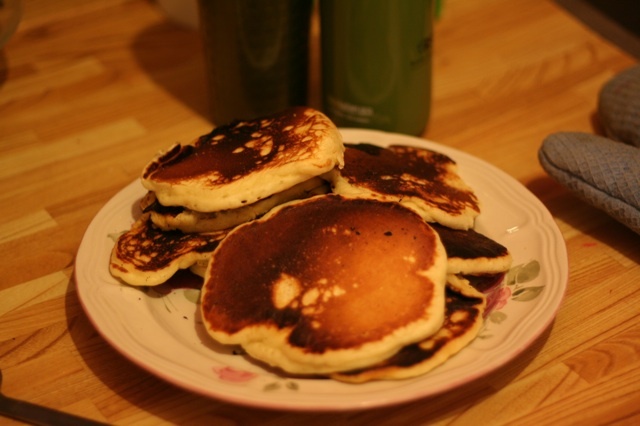 Use 1/4 cup of batter for each pancake. Greasing griddle/frying pan for first round only. Toronto has had a pretty pathetic winter so far, with temperatures ping-ponging above and below freezing and more rain than snow. 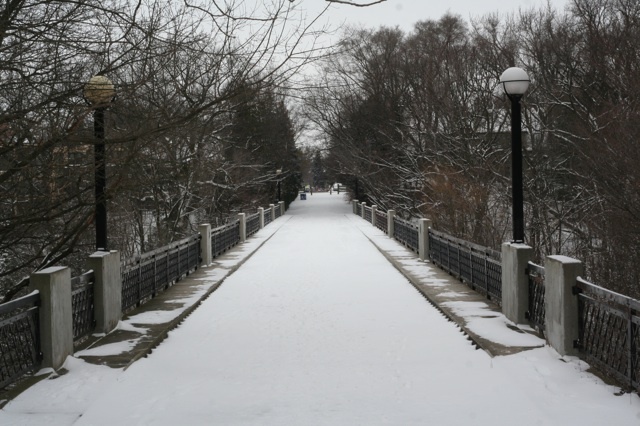 So, when we woke up Saturday morning and it was snowing (and had clearly snowed most of the night), we decided to take advantage of it. It was early enough that most of the snow was still untouched, although all along the streets in our neighbourhood people were out shovelling their driveways and the sidewalks in front of their houses. We saw a lot of little kids excited for an excuse to wear their snowsuits. 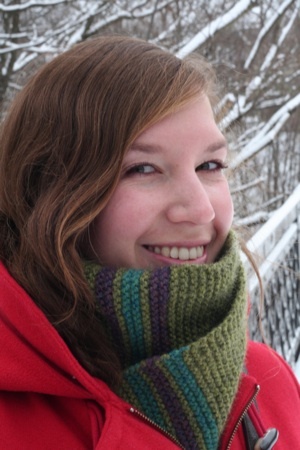 Speaking of which (although only sort of): I knit this scarf in early January when I was still gearing up for the cold and snowy winter that seemed imminent. I may get around to writing a proper post about it (with a more representative photo), but in the meantime, the easy details are that it’s knit with Cascade Eco+ on 6 mm needles. It is cosy and warm and goes surprisingly well with my bright read coat. 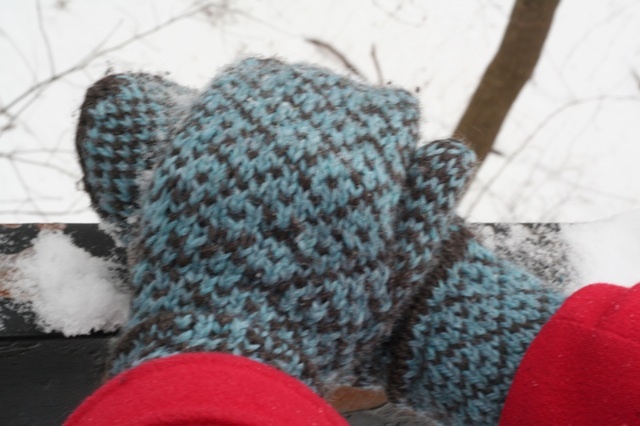 Also knit with Cascade Eco+ are my Diamond-Backed mitts (pattern, and less blurry photo, forthcoming). We had a lovely walk and a busy rest of the day, so on Sunday we decided to be homebodies. We’ve been watching the new season of BBC’s Sherlock, and oh, it is excellent. I knit through the first episode and then we decided it was time to make some lunch. What could be more perfect for a cold and lazy day than pizza? 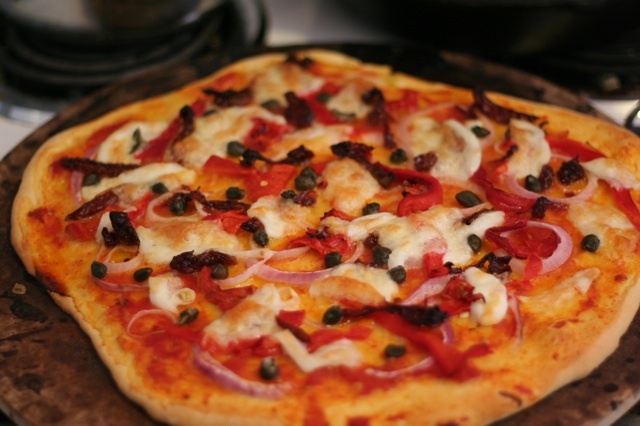 The recipe for the dough and sauce are below; toppings-wise we used Buffalo mozzarella, roasted red peppers, sundried tomatoes, and capers one the first and all those things plus red onion on the second. Yum yum. 1. Combine dry ingredients. Add mashed potato and olive oil. Mix together while slowly adding water. 2. Turn onto lightly-floured surface and knead until smooth and elastic (about 5-7 minutes). Shape and layer with toppings. (Makes dough for one pizza). 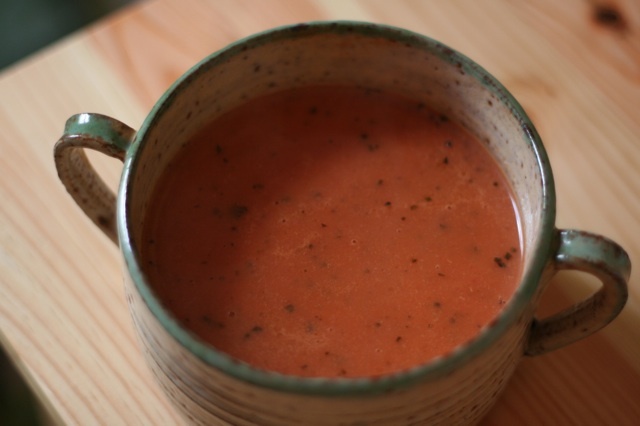 For tomato sauce, I use one can of Marzano tomatoes (remove about 1/2 cup of the liquid), gently mash the tomatoes with a spoon and season with salt and pepper (if you want it a little bit spicy, add some chili flakes). Freeze whatever you don’t use for later.